Chronic Wasting Disease (CWD) is a wildlife disease related to BSE or “mad cow” disease and scrapie in sheep. It is fatal to deer, moose, and other cervids, such as elk. Based on the results of Fish and Game Department CWD monitoring efforts in which 6,261 deer have been tested since 2002, CWD does not currently exist in New Hampshire. Activities that artificially concentrate deer greatly increase the spread of the disease and make control much more difficult. Please do not feed deer—ever. The Centers for Disease Control and Prevention states that, “There have been no reported cases of CWD infection in people. However, animal studies suggest CWD poses a risk to some types of non-human primates. These studies raise concerns that there may also be a risk to people.” We recommend the following common-sense measures to prevent possible exposure to all wildlife diseases: 1) wear rubber gloves when field dressing your game, 2) bone out the meat from your animal, 3) wash your hands, knives, etc. when done, and 4) avoid eating brain, spinal cord, eyes, spleen, tonsils, and lymph nodes of harvested animals. The importation of hunter-killed white-tailed, black-tailed or mule deer, moose and elk from CWD-positive jurisdictions is prohibited except for: de-boned meat; antlers; antlers attached to skull caps from which all soft tissue has been removed; upper canine teeth clean of all soft tissue; hides or capes with no part of the head attached; and taxidermy mounts. CWD-positive jurisdictions currently include: In the U.S., Arkansas, Colorado, Illinois, Iowa, Kansas, Maryland, Michigan, Minnesota, Mississippi, Missouri, Montana, Nebraska, New Mexico, North Dakota, Ohio, Oklahoma, Pennsylvania, South Dakota, Texas, Utah, Virginia, West Virginia, Wisconsin and Wyoming; in Canada, Alberta and Saskatchewan. It is possible for new CWD-positive jurisdictions to be added following publication of this digest. For the most up-to-date list, visit huntnh.com/wildlife/cwd.html or call (603) 271-2461. N.H. hunters hunting deer in New York should be aware that it is illegal to transport the carcasses through Vermont or Massachusetts. Natural urine-based lures have the potential to spread Chronic Wasting Disease (CWD). A number of studies have shown the infective protein that causes CWD is present in urine, feces, and saliva of infected animals. 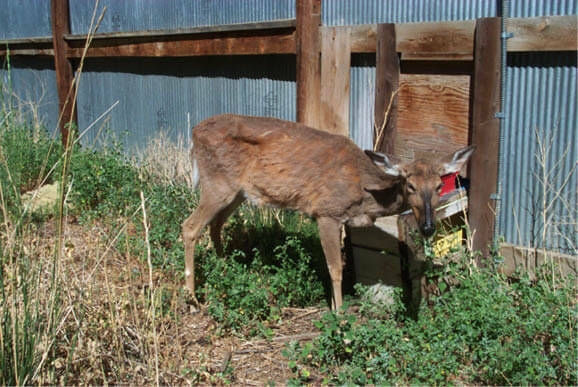 Urine for lures is collected from deer in captive facilities held in pens over grates which collect a mixture of urine, feces, and saliva. Many of these facilities are located in states where CWD is already present. These lures do not undergo any treatment that might inactivate or kill disease-causing agents, and there is currently no testing of commercial lures for the presence of CWD proteins. The infective protein can persist in the environment for years as a source of possible infection to the state’s deer and moose herds. Several states and Canadian provinces have already banned their use and possession due to the potential risks. N.H. Fish and Game recommends using one of many effective synthetic lures on the market, which do not pose a risk of spreading disease to our deer and moose populations. For more information, visit www.huntnh.com/wildlife/cwd. « Hunt with an Apprentice!